Less than four years after the birth of the Ultimate Fighting Championship, two personalities would make their organizational appearances at UFC 12. Fast forward 20 years to the present, February 7, 2017, and both men have become legends, pioneers, and almost certain Hall of Famers. Joe Rogan has been with the UFC since first appearing as the backstage interviewer at UFC 12: Judgement Day, Feb. 7, 1997. He took the color commentator position in 2002. Today he is the UFC’s chief color commentator. 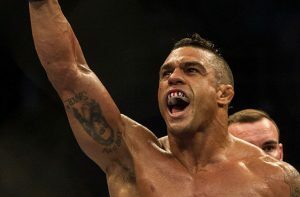 At the age of 19, Brazilian, Vitor Belfort came to the United States to compete in mixed marital arts. In his first sanctioned MMA fight, an event called Superbrawl in Hawaii, his opponent was Jon Hess, whom the young Brazilian defeated in 12 seconds by knockout, despite Hess having a seven-inch height advantage and a more than 100-pound weight advantage. Soon after Belort moved on to compete in the UFC, where he was given the nickname ‘The Phenom.’ He would compete on the very same card where Rogan would launch his UFC career. Belfort defeated two fighters in his debut event in the UFC, winning the UFC 12 Heavyweight Tournament. At age 19, Belfort became the youngest fighter to ever score a victory inside the octagon. Belfort’s next contest saw him score a technical knockout (TKO) against the UFC 6 runner-up Tank Abbott in a non-tournament fight, knocking Abbott down and finishing him with a ground and pound attack. Belfort’s career path would see him earn the UFC light heavyweight title. He would also earn a UFC middleweight title shot, but also spent time outside of the organization fighting for Pride Fighting Championship, Cage Rage, Strikeforce, and Affliction. Belfort is expected to headline UFC Fight Night 106 on March 11 against rising star Kelvin Gastelum. The fight will be held in Belfort’s native country of Brazil.